Ugandan socialite Zari Hassan has decided to finally end her relationship with Diamond Platnumz. File photo. Socialite Zari Hassan aka ‘The Boss Lady’ took to social media and confirmed that she was breaking up with Tanzanian singer Diamond Platinumz. The Ugandan born mother of five posted the developments on her instagram page, citing Diamond’s consistent cheating as the cause of her decision to end the relationship. “Understand that this is very difficult for me to do,” Zari posted on her Instagram. “There have been multiple rumours some with evidence floating around in all sorts of media in regards to Diamond’s constant cheating and sadly i have decided to end the relationship with Diamond as my respect, integrity, dignity and we’ll being can not be compromised. Diamond is rumoured to have several extra-marital affairs with different women, some of which have seen him father children. Last year, there were rumours that the celebrated singer had had an affair with Tanzanian model Hamisa Mabeto. Diamond came out and confirmed the events along with accepting that the relationship had resulted into a child he later named Dylan. Late last year, Diamond was again rumoured to be having a relationship with Tanzanian TV host Dilish Mathews which he denied. Zari claims the two (Diamond and her) will continue parenting their two children together despite the end of the relationship. “We are separating as partners but not as parents,” continued Zari in her instagram post. “This doesn’t reduce me as a self made individual, and as a caring mother, and as the Boss Lady you have all come to know. I will continue to inspire the world of women to become boss ladies like me,” Zari continued in her instagram post. “I will teach my four sons to respect women and my daughter what self respect means. I have been in the entertainment industry for 12 years and despite the challenges, I have come out as a victor and so are all of you Zari supporters,” the mother of five wrote. Zari is believed to have left Tanzania immediately for South Africa where she oversees her late husband, Ivan Ssemwanga’s businesses. 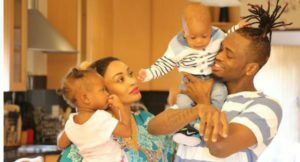 Zari and Diamond have been officially a couple for over two years ever since the self proclaimed Boss Lady left Ssemwanga who is the father of her other three children.